COMCON016 Green Lantern Minifigure is a promotional DC Comics Super Heroes LEGO set released in 2011. 1500 copies of it were given away to lucky raffle winners at the San Diego Comic-Con 2011. A second version of the card was released at the New York Comic-Con, with a similar print run. It contains an exclusive pre-release Green Lantern minifigure, and a card (with an attached brick) that gives information on the Super Heroes Super Challenge Contest. 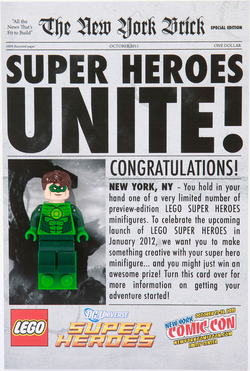 The front of the card is made to look like a newspaper, and features a Green Lantern minifigure mounted in a green brick, attached to it. At the top of the front side, there is a "headline", and the "newspaper's" logo, and at the bottom are the logos of the convention, DC Universe Super Heroes, and LEGO. On the back of the card there is another paragraph of text, and an image of the Green Lantern in action. The San Diego version features an image of a physical Green Lantern outside the convention centre, and the New York one a digital image of him flying. The Green Lantern has unprinted dark green legs, a green torso printed with a muscular body covered by his green costume, as well as his logo, outlined in lime green. He has dark green arms, and green hands. His face is flesh-coloured, and features, on one side, a smirking face, and on the other an angry snarl. Both sides have a green mask over their eyes. He has dark brown curly hair, of the same sort used for Mutt Williams. The Green Lantern released in this set is a preview edition, However, unlike the other preview giveaways, he didn't appear in a set until 2014. Two, slightly different versions of the give-away were made available, one for the San Diego Comic-Con, and one for the New York one. The front of the SDCC version. The back of the SDCC version. The back of the NYCC version. Facts about "COMCON016 Green Lantern Minifigure"